It seems that from the time a child starts school, s/he gets asked by parentals, “What are you going to be when you grow up?” By the time s/he has graduated, the question becomes, “Why aren’t you out doing something yet?” For many a disenfranchised youth like the title heroine of Lisa Litberg’s coming of age novel, Free, sometimes you just have to dial down the noise of others’ expectations in order to hear the music of what your own heart and soul are trying to tell you. Q: What was the inspiration behind your decision to write this tale of wanderlust? A: In my younger years I, like Free, traveled around the country following the Grateful Dead. Unlike Free, I had a home to go to in between tours, but I met many people who didn’t and who remained nomadic year-round. Their lifestyle fascinated me, so I decided to create a fictional story of one such person. Q: What’s the setting and circa of Free’s journey and why was it important to utilize multiple locations for that journey of discovery and self-awareness to take shape? A: Each chapter of the book takes place in a different location in the U.S. I did this to illustrate the journey that Free is taking, both literally and figuratively. The reader gets a sense of movement, of searching, and begins to question the idea of ‘freedom’. Q: Do any aspects of Free’s personality mirror your own? A: Free and I are actually very different people. I am very open; Free keeps to herself. She is guarded and reticent. Free doesn’t know who she is or where she belongs; I have always been fairly confident and self-assured, and conscious of my place in the world. We do have some similarities. We both love to travel, and in doing so, we both have put ourselves in situations in which we are at the mercy of strangers. We both love music. We’re both pretty calm and rational. Actually, Free is probably a bit calmer than I am. Q: Who will this story appeal to and why? A: Definitely Deadheads, especially those who toured in the 1990s, when the story takes place! But I think it appeals to anyone who remembers how unsure we were in young adulthood, that cusp between teenager and grown-up. If you like road trips, you’ll probably like this book as well. Q: What do you hope your target readers will gain from it by the time they reach the last page? A: I think my novel raises questions of what it means to be free. Sometimes what appears to be freedom is actually confinement. Sometimes those who are confined are really free. Freedom comes from within. I’d like to think my readers are confronting these questions within themselves. Q: What governed your choice to use first person/present tense? A: My most common compliment from readers is “I felt like I was right there with Free!” This is why I used first person/present tense narration. The story is unfolding, as seen through Free’s eyes, as we read it. We are watching the events transpire. I love this style of writing, even though I feel as if I don’t see it a lot. Q: Were any scenes in the book challenging or unsettling for you to write? A: Without giving too much away, it was very hard to write the later scenes about Eric. His struggles felt very real to me, and reminded me of people I have known. I also felt uncomfortable developing Free’s relationship with Ed. I think he’s the most frightening character in the book. In some ways, I wish I developed their story further, but in many ways I’m glad I didn’t. He really creeps me out. Q: Of all the characters Free encounters, which one would you most like to see in a spin-off title of his/her own? A: Charlie! I absolutely love Charlie. I wish he really existed; I think he’d be my soul mate. A: Ooh I love this question! I think James Franco would be perfect as Eric. In fact, Eric kind of looks like Franco in my mind. Jennifer Lawrence would make a good Free—she can portray quiet strength well. I love Johnny Depp so I’d like to fit him in there—maybe he could be Joe. He likes playing sketchy characters. How about the guy who plays Thor as Charlie? And Juliette Lewis as Annie? This is fun! Q: Like many a young protagonist without strong ties to the concept and security a home represents, would Free best be described as “running away” or “running toward”? A: Both. Free is running away from her old life, and even though she has no true destination in mind, she is definitely running toward her future. She has no choice. Q: If you could have one person, living or dead, read your novel, who would it be and why? A: My father. He passed away about a year before it was written. He would be so proud. Q: Whether this person was effusive with praise or harshly critical of your storytelling style, how would it affect your passion for the craft? A: Well one thing about my dad was that he didn’t really sugarcoat much. If he didn’t like my book, he would’ve told me what he didn’t like about it. But I think he would’ve liked it. Either way, I’d still write, and my father would expect and want me to. Q: The decision to create your own imprint, Scribomusing Press, is consistent with many of today’s authors that want to have more control of their own intellectual property. What do you know about publishing now that you didn’t know when you started? A: I didn’t realize I would like self-publishing. I was actually published by a company who, unfortunately, closed within a year of my publication. I loved working with them, and I am so grateful that they provided the formatting, editing, cover art, etc. But self-publishing has many benefits. I like being able to track my sales daily. And being forced to market my own book has taught me much about the industry. I’m still learning every day as I go! Q: Among the many things you can be proud of along your career path was empowering urban students to express themselves through the written word. Do you feel that this is a harder or easier objective than it was when you first began teaching? A: This has always been one of my favorite parts of teaching English. I think memoirs should be required in the high school curriculum. I am always amazed and humbled by what my students produce. Many of them have weathered difficulties that most of us never even dreamed of in high school. Telling their story strengthens them. And reading them enlightens me. Q: In your view, what impact has the combination of technology and the continued erosion of the nuclear family had on creating insularity and poor communication skills in today’s younger generation? A: Well that’s an interesting question! I do know that students today are constantly on their cell phones. It’s a constant battle to keep them out. They expect things immediately—there is very little delay of gratification in their world. Plus there’s a safety in communicating through social networking—you don’t have to feel like you’re really talking to the person, so you’re more apt to say things you wouldn’t in person. This can have disastrous effects. On the other hand, technology has increased communication in many ways. We can email someone on the other side of the world and have an instant response, or Skype with Grandma in Miami even when we’re somewhere else. This is definitely a positive. Q: If time and money were no object, how would you solve that sense of societal disconnection? A: I fantasize about creating urban communities in the city. I want to buy those big multi-unit courtyard buildings and outfit them with community gardens, childcare, job training/recruiting, social clubs….I have lived in buildings like that where I only knew the people directly above and/or below me, but we all shared a common basement and backyard. That really bothered me. There’s so much disconnect in the city. Q: How does your writing practice fit into the rest of your life? What else have you written? A: I have written countless poems, short stories, essays, speeches, and songs. I’m always writing something. I have a notebook with me almost wherever I go. I’m old school like that. A: I started a science fiction piece influenced by some of the changes happening in public education. I’m not sure if it’s going to be a short story or something longer. 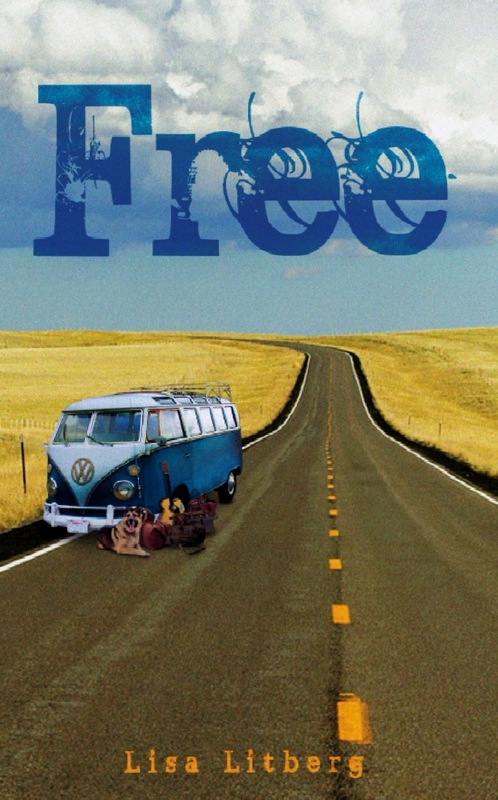 But at the moment I put that aside because so many readers have been clamoring for a sequel to Free. Finally I broke down and started one. Q: Your best advice to new writers? A: Read all the time. Write all the time. Don’t be afraid to take a chance. Let people read your work. Listen to them, but don’t let one person deter you. Some people will love your work and some won’t. That’s just how it is. Believe in yourself and get your words out there. Q: Where can readers learn more about you and – even more importantly – buy your books? This entry was posted in adult fiction, coming of age, fiction, Grateful Dead, Lisa Litberg, literature, road trip, self-discovery, wanderlust and tagged adult fiction, coming of age, fiction, Grateful Dead, Lisa Litberg, literature, New Adult, road trip, self-discovery, wanderlust.